Specifications: blades 28" x 5/16" notched, 1 3/4" hi-carbon steel gang rods, 10 1/2" blade spacing, steel fabricated spools, trunion mounted triple sealed gang bearings with wear guards, two 4" x 16" hydraulic lift cylinder, four 3" x 10" hydraulic wing cylinders, 16 to 30 degree gang angling, 2 3/4" diameter hi-carbon steel slip-in spindles, 8,000 lb. rated wheel hubs and bearings, transport safety lock pin, safety tow chain, SMV emblem, tapered blade group on right rear gang, main frame 4" x 8" x 1/2" structural tubing, gang frames of 3 - 3 1/2" x 3 1/2" x 3/8" steel tubing, transport width 15'3". Three sizes: 22'0", 23'10" and 26'7". Weight: 13,440 to 15,618 pounds. Options: blade cleaners, clevis tongue, dura-faced blades, rear utility hitch, gang connector, bolt-on blade extensions and hydraulic hose kit. 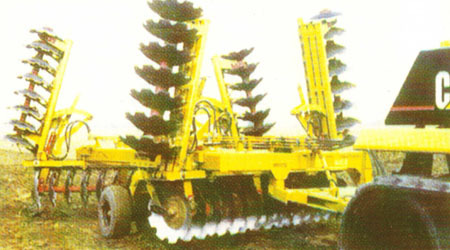 Features: These three series of wing-fold offset disks are ideal for growers who must transport their equipment on the highway from one field to another. The patented hydraulic folding mechanism allows for using small 3 1/2" x 10 cylinders, folding to a transport width of only 15'3". All four wing cylinders are operated from one remote hydraulic valve on the tractor. Each wing is equipped with a flow control valve which limits the speed of raise and lower at a safe and smooth level of operation. The drawbar design permits shorter turns behind dual wheel tractors. Leveling linkage keeps disk level in all stages from disking to transport. Two heavy compression springs absorb shock loads.